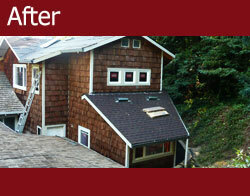 Where everything fits together: your vision, our experience and a relationship built to last. ~ the firm has broad knowledge of suppliers and specialists in the area; the firm is committed to high standards and client satisfaction. 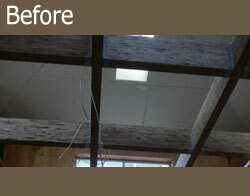 Click the images to view the full gallery of each project! 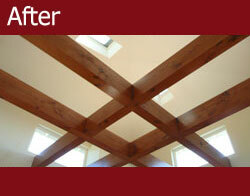 Old beams replaced with new beautiful beams in this living room makeover. The old fireplace was replaced with a natural stone veneer and a custom constructed red oak mantel with a copper wood storage box. Click here or the images to see more photos! 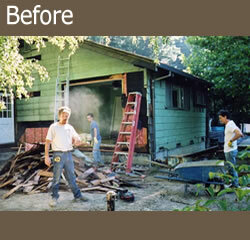 The old kitchen has been torn out to make way for a kitchen that is updated. Click here or the images to see more photos! 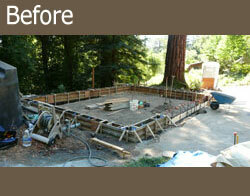 Begin foundation of two and a half car detached garage on Schulties Road. 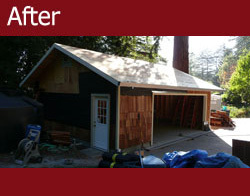 Garage substantially completed matching existing adjacent construction with the medium shake sidewall finishes. Click here or the images to see more photos! A worn out wooden deck and balcony on Call of the Wild. 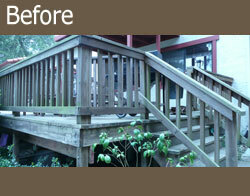 The completed deck done with Trex Brasilla. Complete with benches and gates like before, less the word splinters in the lil� guys feet. Click here or the images to see more photos! Longridge Road pool bathroom completed just in time for wedding guests. Tile design by owners. Click here or the images to see more photos! A poorly constructed deck with a killer view in Las Cumbres. A new Las Cumbres deck worthy of the view. 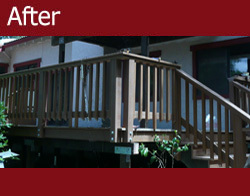 Trex deck planking with cable rail handrails. Click here or the images to see more photos! 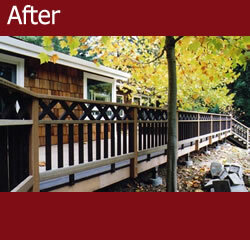 Begin two pergolas construction on each end of Bacce ball court designed by Hugh Carter Architect. Note shade structure erected to facilitate pre staining of components before assembly. Looking southwest. 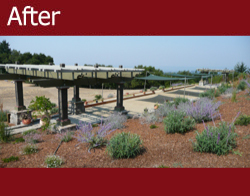 Completed easterly pergola with four color scheme. Landscape lighting transformer in foreground augments primary lighting capable of being controlled from three locations. 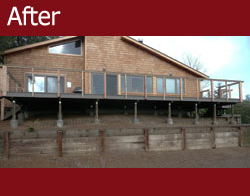 Landscaping by Baxter Landscaping in Boulder Creek. Click here or the images to see more photos! Beginning a small two story addition. Very tight site conditions with multiple adjacent previous additions. 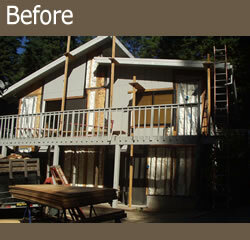 Addition substantially completed and seamlessly joined with adjacent construction. Click here or the images to see more photos! 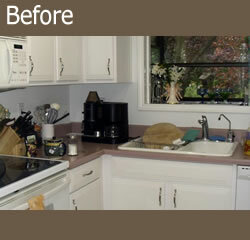 This kitchen occupied an enclosed 100 sq. 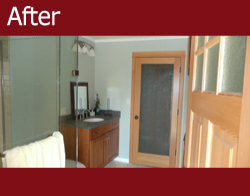 ft. space with a single door but was expanded and remodeled to reside in approximately 200 sq.ft. 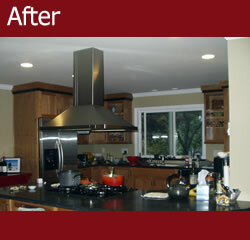 This expansion allowed for the removal of a wall, opening the kitchen up to the dining area. 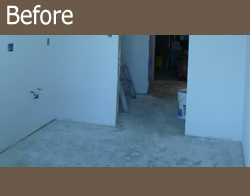 A side entry was included to make the kitchen accessible from the front entrance hallway as well. 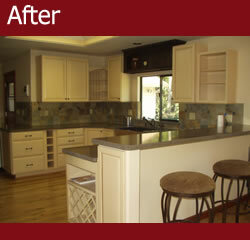 The updated cabinetry and appliances finished off the remodel, thus turning this into a beautiful modernized kitchen. Click here or the images to see more photos! 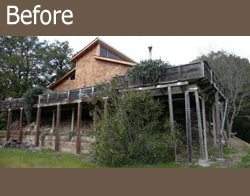 This 850 ft. Trex deck included one bench seat, tree trunk wrap-around bench, and a hot tub. 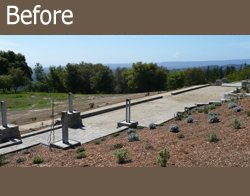 All materials for floor, bench, and steps were sandstone Trex material. 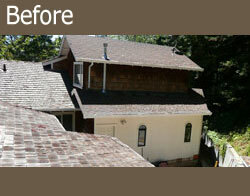 The custom diamond lattice pattern was brown Trex material. Click here or the images to see more photos! 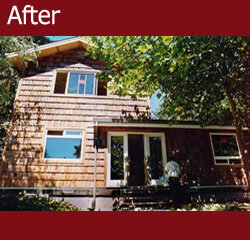 This 490 square foot addition included bath, bed, and laundry rooms. 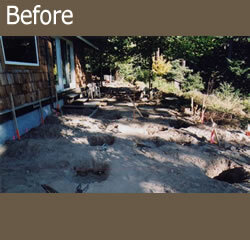 Amoung the sections remodeled were master bedroom, new foundation and footings, as well as the second floor. Click here or the images to see more photos! 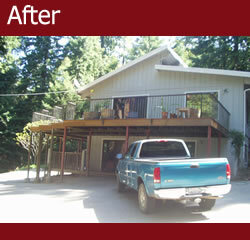 Deck and Seismic Upgrade. Click here or the images to see more photos! 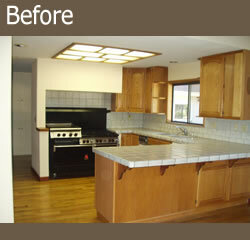 A kitchen originally designed in the 1980s was given a fresh remodel for today's contemporary designs and functions. 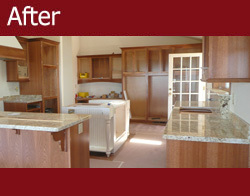 The kitchen was expanded by combining the separate pantry into a larger kitchen area doubling countertop space, cabinets and pantry. 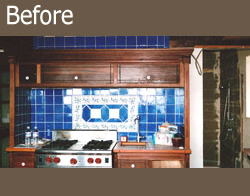 The new professional 5-star gas range was placed centered between two-toned antique finished cabinetry. The new slate stone tile backsplach continues throughout the kitchen, running parallel to qray quartz countertops and behind the simulated stone farm sink. Custom chisled edging on the countertops to handpainted coverplates to match the earthtones in the slate stone tile make this kitchen makeover a truly personal and unique living and working area. Click here or the images to see more photos!